"We think of our version of a happy life as more like physics than like pop songs; we expect the people of the next century to agree with our basic tenets--for instance, that broccoli is good for a happy life and that opium is bad--but they will not. Our rules for living are more like the history of pop songs. They make weird sense only to the people of each given time period. They aren't true. This book shows you how past myths functioned, and likewise how our myths of today function, and thus lets you out of the trap of thinking you have to pay heed to any of them." 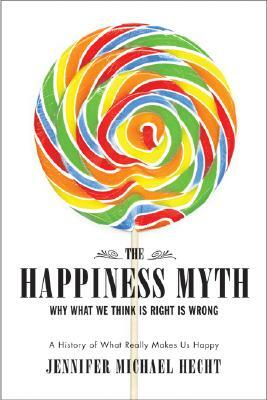 The Happiness Myth is a fascinating cultural history that both reveals our often silly assumptions about how we pursue happiness today and offers up real historical lessons that have stood the test of time. Hecht delivers memorable insights into the five practical means we choose to achieve happiness: wisdom, drugs, money, bodies, and celebration. Hecht liberates us from today's scolding, quasi-scientific messages that insist there is only one way to care for our minds and bodies. Hecht looks at contemporary happiness advice and explains why much of it doesn't work. "Modern culture," she writes, "is misrepresenting me and spending a lot of money to do it." Rich with hilarious anecdotes about both failed and successful paths to happiness, Hecht's book traces a common thread of advice--she calls it "sour charm wisdom"--that we can still apply today to create authentic, lasting happiness. "Among the raft of happiness books published lately, this one is the obvious standout. I suggest climbing aboard." "Hecht's curiosity ranges widely, and the breadth of her learning is impressive. Fresh and daring analysis."